Many enterprise organizations I have worked with has Hybrid Identity infrastructure in place and external partner accounts are managed at on-premises Active Directory, just like old days. Naturally, when organizations are using cloud services more and more there is a growing trend where organizations manages partner accounts only in cloud which is another option to manage partner accounts. Organizations whose apps are currently at on-premises and are planning to move/migrate applications to the cloud might wonder what to do with partner accounts, how to grant access to the applications for partners when apps are moved to the cloud? From guidance below you can find instructions how to achieve situation where partner account is managed at on-premises and is using same identity to sign-in to on-premises and AAD resources. Such a scenario can be achieved with custom rules on AAD Connect. 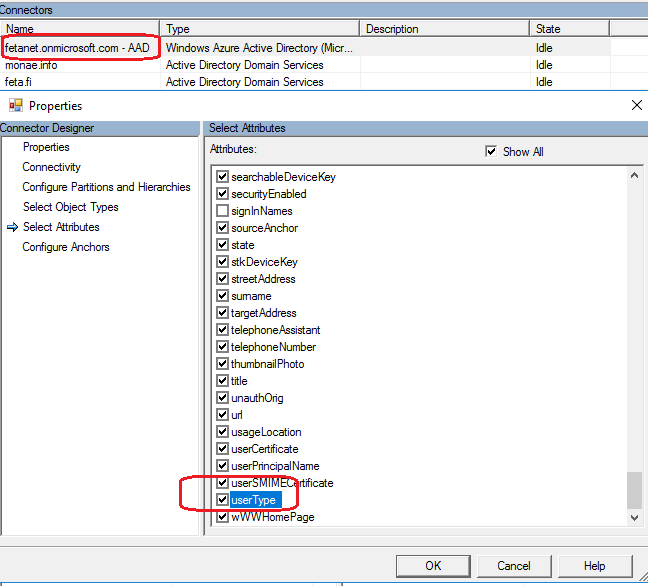 Identify an unused on-premises Active Directory attribute (for example, extensionAttribute1) to use as the source attribute. Alternatively, derive the value for UserType attribute from other properties. For example, synchronize all users as Guest if their on-premises Active Directory UserPrincipalName attribute ends with the domain @partners.company.com. 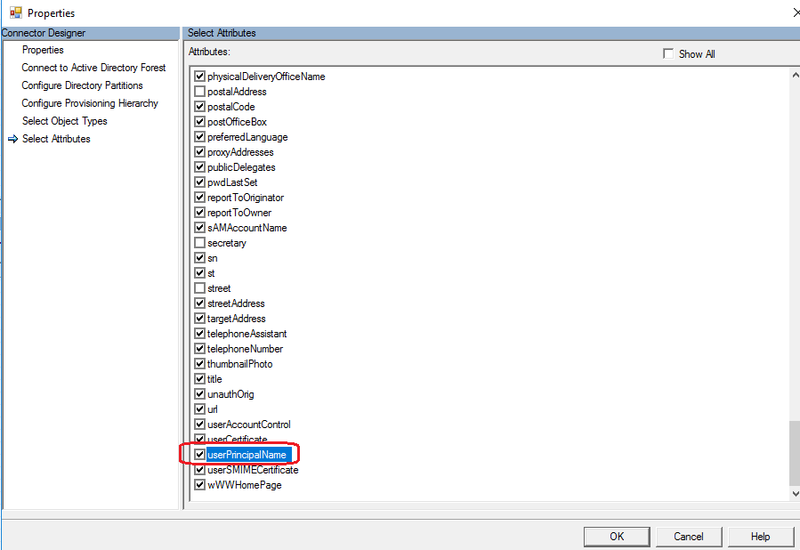 When unique attribute is identified, Azure AD Connect is configured to sync these users to the cloud as Azure AD B2B users (that is, users with UserType = Guest). From an authorization point of view, these users are indistinguishable from B2B users created through the Azure AD B2B collaboration invitation process. 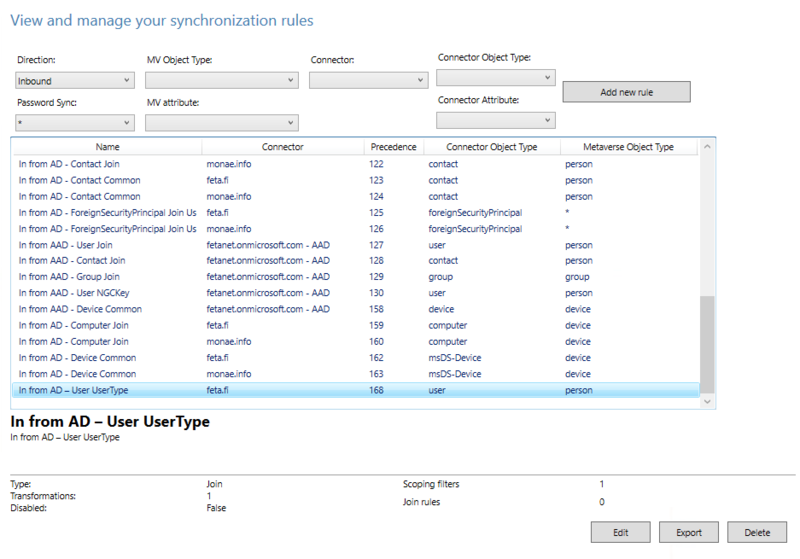 UserType is not enabled by default for synchronization because there isn’t corresponding attribute in on-premises Active Directory. It needs to be manually enabled and AAD Connect version needs to be 1.1.524.0 and later to support it. Precedence: 50 (1–99 is reserved for custom sync rules. Do not pick a value that is used by another synchronization rule, if you do in saving phase you are receiving and error). 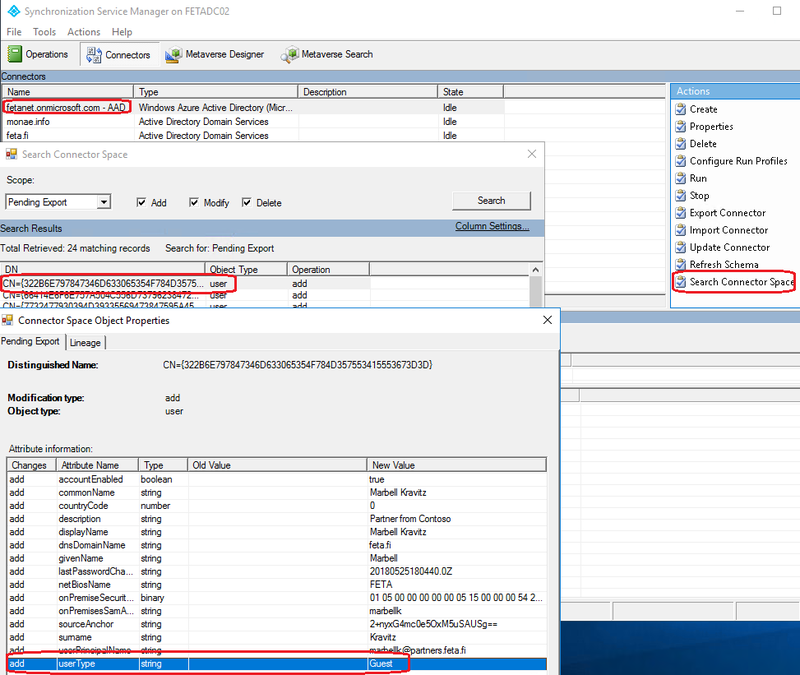 Verify pending exports from Azure AD connector using search connector space mechanism with Add, modify and Delete values (picture below). “The UserType has no relation to how the user signs in, the directory role of the user, and so on. This property simply indicates the user’s relationship to the host organization and allows the organization to enforce policies that depend on this property”. Guest users can be easily identified from Azure AD and this information can be used together with Conditional Access policies to require certain conditions from Guest users when they are accessing to cloud application, for example MFA.